Airbreathing rocket-derived propulsion systems are generally operated up to Mach 6 or less because of pressure and temperature limits of the air induction system [Miki et al., 1993]. At Mach 6 inlet diffuser static pressures can typically equal 20 atmospheres and 3,000°R (1,666 K). Airbreathing rocket propulsion concepts employ a method to reduce the temperature of air entering the inlet system so it can be compressed to rocket chamber operating pressures with reduced power requirements. There are two options. One option is to deeply cool the air just short of saturation and use a turbocompressor to compress the cold gaseous air to the rocket chamber pressure and inject it into the combustion chamber. The second option is to liquefy the air and use a turbopump to pump the liquid air to rocket chamber pressure, then gasify it for injection into the rocket chamber, see Figure 3.3. The rocket motor operates at nearly normal oxygen-to-fuel ratios, except that there is now a large mass of nitrogen also introduced into the combustion chamber. Again the mass average exhaust velocity is reduced and the total mass flow increased, increasing thrust and propulsion efficiency. enormous source of energy. Via a hydrogen/air heat exchanger, atmospheric air can be cooled as the liquid hydrogen is boiled, requiring no energy expenditure from the aircraft's systems. Ahern [Ahern, 1992, 1993] was associated with the development of the first LACE system in the United States when working with the Scramjet team at The Marquardt Company in 1958. As part of that work Ahern proposed a closed helium heat pump that avoided the problem of having two phase changes in the hydrogen/air heat exchanger (air being liquefied as hydrogen is gasified) and of having a hydrogen heat exchanger in the air inlet. To the authors' knowledge this concept has never been developed beyond the laboratory. Ahern also had a concept of recovering the aircraft aerodynamic heating in the hydrogen flow to the engine and use that energy to create useful work (electrical, hydraulic and air handling work) and engine thrust (thrust from supersonic hydrogen fuel jet, injected into the scramjet). This will be discussed in the section on ram/scramjets. As depicted in Figure 4.11, this cycle employs a hydrogen/air heat exchanger in the air inlet to capture the inlet air kinetic energy from the incoming air and cools it to nearly saturation. The cooled air is then pressurized to a few atmospheres and then flows into the pressurized liquefying heat exchanger. The total thermal energy collected from the incoming air and hydrogen combustion chamber is used to drive an expansion turbine, which in turn drives a turbopump that pumps liquefied air into the rocket motor. A rocket motor combustion chamber heat exchanger is necessary to provide sufficient energy to drive the turbomachinery [Tanatsugu, 1987]. In effect the rocket becomes an airbreathing rocket for Mach number less than 6. In this concept there is no need for another airbreathing engine. This cycle reduces the mass ratio to the 5.0 to 5.8 range and the oxygen to fuel ratio to about 3.5. Figure 4.12. Variable capture area, inward-turning inlet. independently developed at TslAM [Rudakov and Balepin, 1991a] and by Alan Bond for HOTOL. A rocket motor combustion chamber heat exchanger is necessary to provide sufficient energy to drive the turbomachinery in an expander cycle. Both Rudakov and Balepin of TsIAM and Tanatsugu of JAXA, Japan, employ heat exchangers in their rocket combustion chamber. Alan Bond did not for the HOTOL engine, as it could have adversely affected its performance at higher Mach numbers. In effect the rocket becomes an airbreathing rocket for Mach numbers less than 6. In this concept no other airbreathing engine is required. This cycle reduces the mass ratio to the 5.2 to 6 range and the oxygen to fuel ratio to about 3.4. There is a significant discussion of whether a liquefying system is equivalent in weight to a deeply cooled gaseous system. In most studies the authors are aware of, it is an even trade-off and other considerations should be used to make the selection. With a suitable inlet system, airbreathing rockets can be integrated into flat-bottomed hypersonic glider configurations (Figure 3.14), as the forebody compression system required by a ramjet/scramjet (Figure 4.2) is not needed. Figure 4.12 shows such an inlet, an inward-turning, variable capture area inlet [DuPont, 1999] that has been wind-tunnel tested to Mach 5 plus. The mechanical details are not shown, but the mechanical actuation and integration is similar to the movable ramps on current supersonic military fighters. The movable lower inlet can be designed to retract even with the lower surface when not in use. Since the outer surface of the lower cowl is the only surface that experiences entry heating, this system is much lighter than an outward-turning inlet. Note that in the low-speed position, the exit of the lower ramp flow is parallel to the lower vehicle moldline. 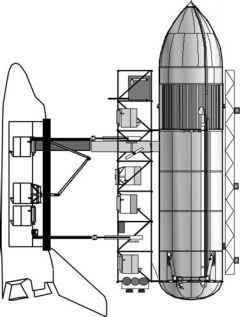 Thus all of the inlet structure is inside the fuselage moldlines, except the lower movable ramp. The inlet has the advantage of turning the flow inward, so there is no bulge in the moldline produced by an outward-turning inlet, such as the half-conical inlets on the Dassault Mirage aircraft. It also has the advantage of changing capture area to match the increasing corrected airflow requirement as speed is increased. The inlet meets or exceeds the Military Inlet Recovery Specification over the entire Mach range. Figure 4.13. Airbreathing rocket configuration concept. Hendrick, 1998]. Figure 4.13 shows an inward-turning inlet incorporated into a hypersonic glider configuration with the engine system represented in Figure 4.11, the LACE or deeply cooled rocket propulsion system. The rocket is installed much as it would be for an all rocket configuration.